A My monograph entitled ‘Buddhism in Ancient Bengal’ was published in the year 1984. I was greatly inspired to undertake this from my late husband, friends and well- wishers, to whom I am greatly indebted. The second edition of the book is a revised and enlarged version. Considerable time has lapsed between the first and second edition. In the meantime several informations have come in the lime-light. One is the Jagivanpur Copper Plate at Maldah founded out by a villager in the course of the digging of the land. The Copper Plate established with some amount of exactitude the identity of king Mahedrapala who was, on the basis of Bahalpillar inscription and images belived to the immediate successors of king Devapala. The Jagjivanpur CP establishers the identity of Mahendrapala as a scion of Pala dynasty and have unraveled a long standing puzzle. The subsequent excavation of the site is still in progress which, provide us with more details about a monastery called Nandadirghika Udarnga monastery, which have been unearthed there. The information gathered from the papers, articles on the excavated site has been incorporated in this edition. About the king Madendrapala no further information is available in the present stage. However, it may be presumed the existence of the monastery he too, like his predecessors patronized Buddhism and followed a policy or tolerance. Excavation started in 1955 till carrying our annually almost regularly Nine major sites have been exposed so far. But it is to be said, publication of Summary result, no full- fledged archaeological reports of the first generation sites, i.e. Salvan Vihara, Kutila mura, Charpatramura have been published. Recently, Separate reports have been issued on Rupban Vihara Ananda Vihara and ita khola mora. 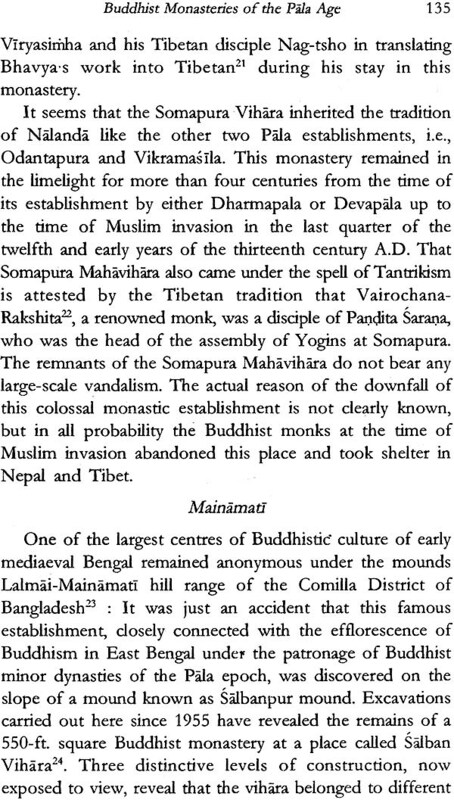 The exploratory study of Mainamati may be viewed as a critical and comprehensive assessment of the excavation of Mainamati, indeed a pioneering effort Abu Immam Said that “reader for the first time will get to know the features of the unique medieval city in a remote corner of the Subsequent, Placed against the backdrop of rise and fall of Buddhism over a period more than six centuries”. Other excavated sites are Bhojavihara, Ranir Banglow, Mainmati mound. I have drawn mainly on the information received from the papers of Bangladeshi scholars and from the papers of Bangladeshi scholars and from publications of Department of Archaeology, Bangladesh. Dr. Gayatri Sen Majumdar is well known renowned Research Scholar on Buddhist Studies. She obtained her Ph.D. degree from Calcutta University in 1977. Her thesis, Buddhism in Ancient Bengal was published in 1984, She received the prestigious B.C. Law Gold Medal in 1971. She received U.G.C. Junior and Senior fellowship. Her book was published entitled ‘Buddhism and Laity’ from Mahabodhi Book Agency in 2008. Apart from this she is a managing Editor of Kalyan Bharti Journal (Yearly). Kalyan Bharti is a reputed Journal and subscribed all the universities in West Bengal and other places. Now she is engaged in Research work entitled Social and Political thoughts of Vivekananda. The Present work substantially embodies my doctoral dissertation Buddhism during the Pala Period', submitted to the University of Calcutta. It aims at presenting a systematic and comprehensive history of Buddhism in ancient Bengal, from circa third century B.C. to the close of the twelfth century A.D. A survey of Buddhism in the pre- Pala age has been made in Chapter 1. While Chapter II deals with Buddhism in the Pala period, with special reference to the patronage extended to it by the Pala monarchs and the members of contemporary minor dynasties, Chapter III aims at a depth-study of Buddhist art and architecture which flourished during this period in Bengal and Bihar (the area the Palas ruled over), along with the reverberations of their styles in the neighboring countries like Burma and Java. 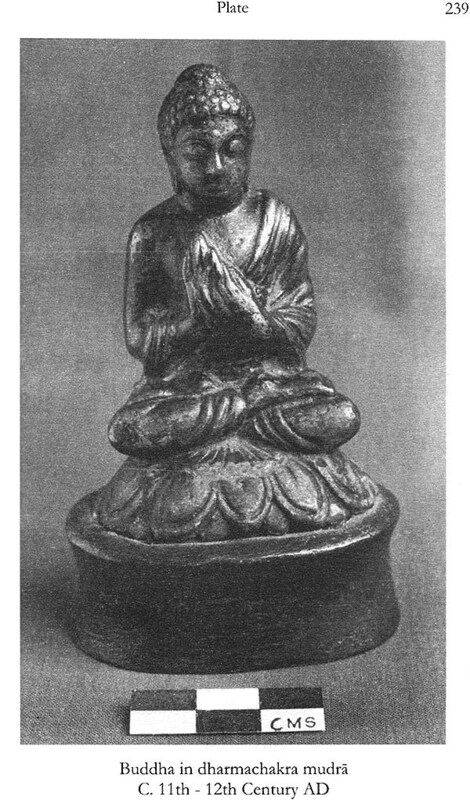 In the following Chapter the evolution of Buddhism has been traced, with an accent on the ideas and ideologies underlying its significant systems the emergence of which the Pala period witnessed ; as in the case of contemporary art-idioms, thoughts and tenets of these new systems also exercised their influence on Buddhism prevailing in countries like Tibet, China and Japan and the importance of this phenomenon has been underlined. Chapter V reviews the upshots of the discussions made in the preceding Chapters. 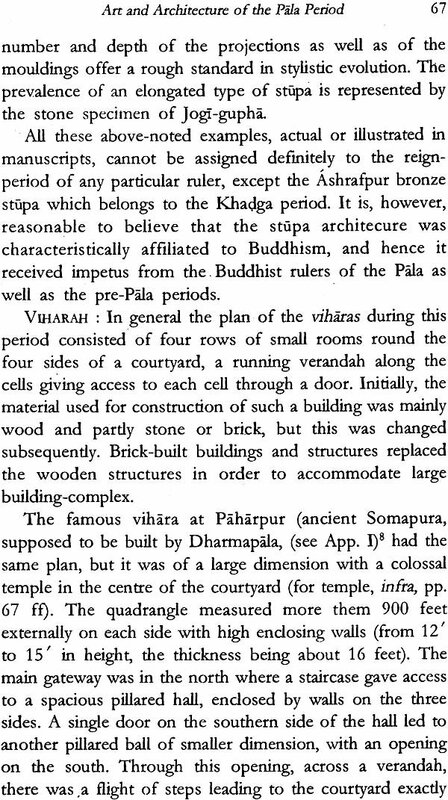 Of the two Appendices, the first gives a coverage to the Buddhist Viharas of the period, while the second comprises a list of inscriptions of the Palas and their times. In the preparation of this dissertation we have subjected all our data to a detailed and systematic examination. Every possible source, archaeological and literary, has been explored and no material has been included here without proper scrutiny. It may be mentioned here that we had a fortunate access to new materials which have recently emerged in course of excavations and explorations at sites like Mainamati and Mahasthan, particularly the former, in Bangladesh. Many of them have been in-corporated in the present work, perhaps for the first time. Although we are indebted to our erudite predecessors, we have occasionally disagreed with their theories and have ventured to offer our own views and suggestions. The disagreement with Benoytosh Bhattacharyya on the issue of the inspiration of Buddhist Tantras leading to the emergence of Hindu Tantrism is a case in point. Similarly, we have suggested that the Buddhist subjects of Sasanka forced their king to adopt a hostile attitude towards them in consequence of their anti-State activities. At the last stage of the printing of my book, I came across Dr P. Niyogis work under the identical title. Understandably I could not change the title. I also regret my inability to consult Dr Niyogis monograph. My grateful thanks are due to my teachers, friends, colleagues and relatives who have shown from the beginning a sustained interest in the publication of my work. I owe a deep debt of gratitude to Professor Anukul Chandra Banerjee, fromer Head of the department of Pali, under whose critical and stimulating guidance I have prepared and completed the present dissertation. Among my other teachers particular mention is to be made of Dr Sukumar Sengupta, former Head of the department of Pali, who has been a never-failing source of inspiration from my student days at the Post-Graduate classes and to him I am most grateful. I must express my heart-felt gratitude to my mother, Smt. Suprity Dasgupta, but for whose unbounded care and affection, it would have been difficult for me to complete this work. Grateful thanks are also due to my brother, Dr Kalyan Kumar Dasgupta, the Head of the department of Ancient Indian History and Culture, Calcutta University, and to my husband, Sri Tapas Sen-Majumdar; Tapas has helped me to give the final shape to my manuscript. I have received encouragement from my esteemed brothers-in-law, Sri Sochi Sen-Majumdar and Sri Nityaranjan Sen-Majumdar and for this I am beholden to them. The illustrations for this book are through the kind courtesy of the Archaeological Survey of India, the department of Archaeology of Bangladesh, the Dacca Museum and the Varendra Research Museum, Bangladesh and the Birmingham Museum and Art Gallery, U.K.; I am thankful to all of them. In this connection I have to thank Professor A. N. Lahiri, former Head of the department of Ancient Indian History and Culture, Calcutta University, for kindly lending me blocks of some photographs from the collection of his department and to Professor Mukhlesur Rahman of the Rajshahi University and the Director of the Varendra Research Museum, Rajshahi, Bangladesh, for kindly supplying two photographs. Finally, I must express my sincere thanks to Sri Biram Mukhopadhyay, the Chief Executive Officer of the Navana Publications, for accepting this manuscript in their co- publication schedule as well as for the meticulous care with which he has seen the book through the press. Hearty thanks are due also to Sri Kunal Kumar Ray, the enterprising Director of the Navana Printing Wroks and the Navarra Publications and to the staff of the Navana Printing Works. "This book has some solid merits-precision, careful arrangement and comprehensive treatment of the subjects, economy of works and a rich awareness on the issues involved. The author deserves a praise and encouragement of not only from students of History but also from intelligent and curious lay readers". There is a good demand for this book among the scholars and general readers which encourage me to bring out the second enlarged and revised edition of this book. Moreover, my friends and scholars of present time request me to publish the second edition of this book. This encouragement inspired me to publish the present edition. 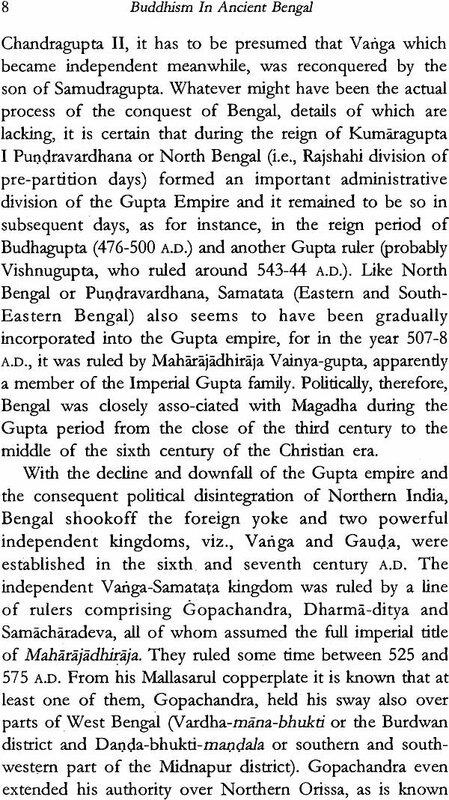 In fact, Buddhism in Bengal during the Pala age is most interesting subject to learn about flourish of Buddhism in Bengal at the time when it was almost eclipsed from rest of India. 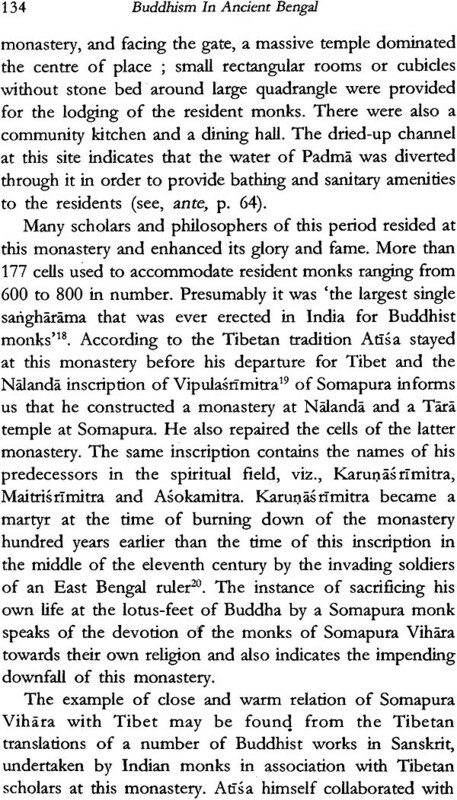 Many discoveries have been taken place about the condition of Buddhism in Bengal during the long span of time after publishing of the first edition of my monograph. The most notable among them is excavation at Jagjivanpur, a village of Maldah District, where a sprawling monastic establishment is discovered. The excavation of this site is undertaken by the Department of Archaeology, Govt. of West Bengal. This excavation uneartherd not only the Buddhist monastic complex but also brings to the light of new information about the real identity of Mahendrapala who was erroneously described as a king of Kanuj. In fact, this discovery has established real identity of Mahendrapala as one of the reigning monarch of Pala dynasty, a son of Devapala. He is described by the scholars before this discovery as the king of Kanuaj. 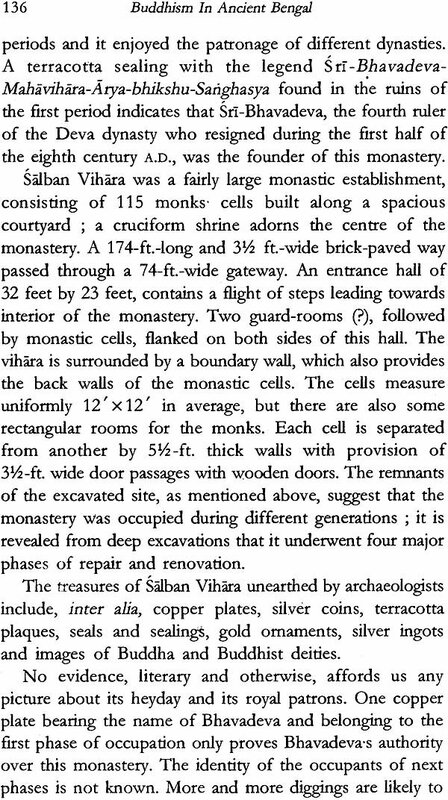 I have consulted the papers and articles of different scholars on the discovery of the Jagjivanpur copper plate and monastery named Nandadirghika Udranga Monastary and also consulted the facts on the basis of the documents unearthed and incorporated same. All these information are given in the Appendix, in an order to make my study of Pala age up to date and comprehensive. I am thankful to author of Bangladesh for new information emerges on the excavation till the present time of Lalmai Mainamati region of Tipper a now in Bangladesh. There is also a new discovery of Buddhist site at Pilak in South Tripura state. I have incorporated this information and illustration of images discovered there. My heartfelt thanks to Mr. Patibrata Bhattacharya, Tripura Museum for supplying two photographs of the images of A valokitesvara and the Buddha. I am also thankful to Dr. Goutam Sengupta, Director General of Archaeology and Museum of Govt. West Bengal. Dr. Amal Ray, Superintendent of Archaeology of Govt, of West Bengal and Sree Tapas Banerjee, State Archaeology Department. Govt. 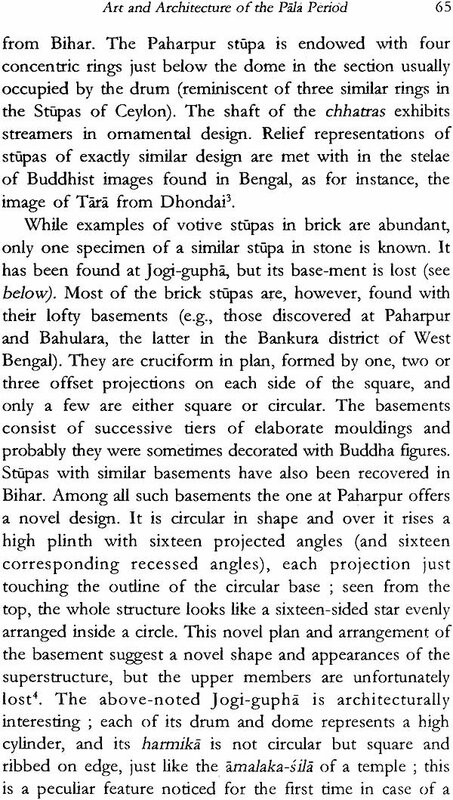 of West Bengal for the help to get the view of the actual specimen discovered from different Archaeological sites in West Bengal and for giving the permission to publish the photograph of some images in my book. I am very much grateful to Dr. Taran Kr. Biswas Director of Birla Museum and fine arts (Calcutta) who helped me meticulonsly to check up of this monograph. I am also indebted to Dr. Rupendra Kumar Chattapadhyay, Reader in the Department of Archaeology in the Calcutta University, helped me in various ways to procure the latest materials. 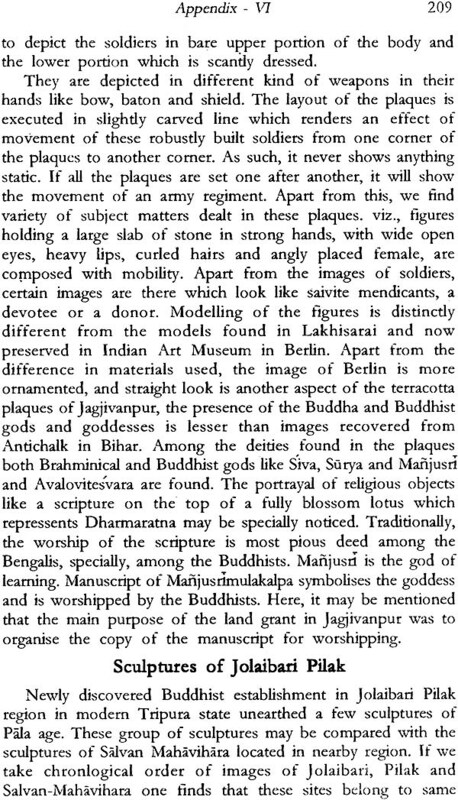 My heart felt thanks to Dr. Kallal Dasgupta for supplying the plague of Jagjivanpur Copper Plates. I fondly remember the hallowed memory of my mother Supriti Dasgupta and my elder brother Professor Kalyan Kumar Dasgupta, Rani Bagisvari Professor of Art University of Calcutta. Their help and encouragement inspired me to devote myself to undertake Research work in Buddhism. They would have very much glad to see the publication of second edition but very unfortunately the death had snatched away from me. My husband Tapas Sen Majumdar encouarged and helped me regading the revised and enlarged edition. Now he is no more. Had he been alive he would have very much happy to publish this book. I am indebted to my Late Tapas Sen Majumdar who had suggested the revised and enlarged edition of publucation of this book. As he died just one year before, on the day of Saraswati Puja in 2011. He did not see its republication which I regret. I am very much indebted to Dr. Debalina Ray who is like my younger sister for accompanying me at the time of visiting different museums and other Archaeological spots for procurement of information for my works. Buddhism found its last refuge in Bengal and stayed here for a comparatively long period before it had finally left for the neighbouring countries. When and how did it enter the province it is not known. It has been suggested that the religion of the Master came to Bengal along with Jainism and AjiIvikism. It has also been held that it flourished as an important religion during the reign of Asoka, but it is doubtful whether it could make much headway at that time (infra, p. 11). However, there are reasons to believe that it was gradually becoming popular with the people of Bengal and in the fifth century of the Christian era. Fa-hien noticed as many as 22 monasteries at Tamralipti only. Unfortunately, the progress of Buddhism was uneven and within a couple of centuries decadence set in, as indicated by the evidence of Hiuen-tsang, another Chinese pilgrim, who visited Bengal in the fourth decade of the seventh century, as well as by the testimony of Lama Taranatha, a seventeenth-century Tibetan writer. Fortune shone once again on Buddhism when the Palas emerged as a political power in the middle of the eighth century. Indeed, the Paramasaugata rulers of this dynasty gave a longer lease of life to Buddhism in the land of its birth by patronising it in every possible way and also worked for its propagation in Nepal, Tibet and South-East Asian countries. In this respect they were followed by a few other minor Buddhist dynasties like the Devas and Chandras, whose activities were mainly confined to the area they had been ruling over. It was during this period again that Indian art and culture accompanied Buddhism to the above-noted neighbouring countries and exercised abiding influence on their art and culture. The history of Buddhism of this period, therefore, deserves a more intensive study than what has been done so far. The sources of the history of Buddhism of ancient Bengal are divisible into two categories : archaeological and literary. The combined testimony of these two types of sources has enabled usto reconstruct this history. The archaeological source consists of epigraphical, numismatic and glyptic, and monumental records. The epigraphs or inscriptions on stone or metal relevant to our period are numerous and their evidence is noteworthy. The land grants issued by the Pala monarchs or those belonging to their reign not only describe them as devout Buddhists (paramasaugata) but also indicate the nature and extent of patronage they extended to the religion of the Master. At the same time these epigraphs spell out the catholicity of the Palas towards other religions. The Khalimpur inscription of Dharmapala, for instance, records his endowment of land for the worship of the Brahmanical god, Nanna-Narayana. The Monghyr copper- plate of his son, Devapala, further informs us that Dharmapala also followed the rules of caste as laid down in the scriptures. Like their husbands, the Pala queens were also respectful to the Brahmanical faith and customs. The Manahali Grant of Madana-pala states that Chitramatika the chief queen of this monarch, regarded the listening to recital of the Mahabharata as a meritorious act. That the religious factor did not vitally affect the contemporary polities will be attested by the Badal pillar inscription according to which a Brahmana Garga was appointed as the minister of Dharmapala and Garga’s descendants occupied the post for several generations. 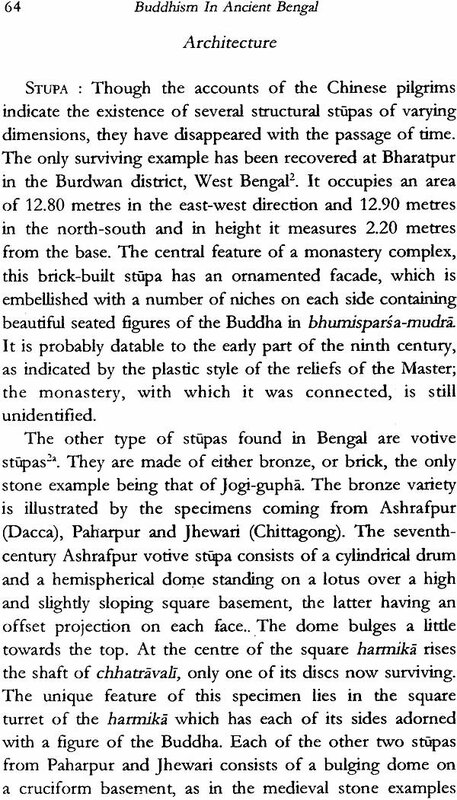 From the epigraphical records again indication is obtained about the significant role played by Bengal in the international sphere of Buddhism. The Nalanda copper-plate of Devapala, dated about the middle of the ninth century A.D., records that it was at the request of Balaputradeva. king of Suvarnadvipa, that the Pala monarch granted five villages for the upkeep of the monastery which that foreign ruler built at Nalanda on the approval of Devapala. Knowledge of doctrinal aspects of Buddhism is also enriched by inscriptions. Thus the oldest reference to Sahajiya or Sahajayana, a later off shoot of Mahayana Buddhism, is found in an inscription of the thirteenth century; the Mainamati plate of Ranavanamalla Hari- kaladeva of the present-day Comilla district of Bangladesh speaks of “a superior officer of the royal groom (?) as practising the Sahajadharma in Pattikeraka in the said region (sahajadharmasu karmasu). 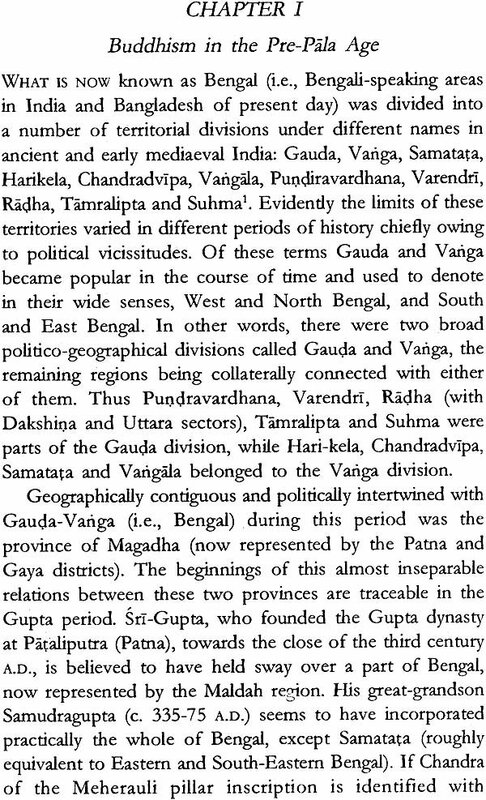 Reference to a Mahayana sect, styled Avaivarttika san gha in the Comilla area is met within a pre-Pala record, viz., the Gunaighar Grant of Vainyagupta, dated 506-7 A.D.
As a source of early Indian history coins and seals come next to epigraphs from point of importance. But so far as our period is concerned, coins have practically come to no help, since both the illustrious dynasties, the Palas and the Senas, are not known to have issued any coin. Similarly, no coin is yet attributable to the minor royal dynasties of the period like the Devas and the Chandras. 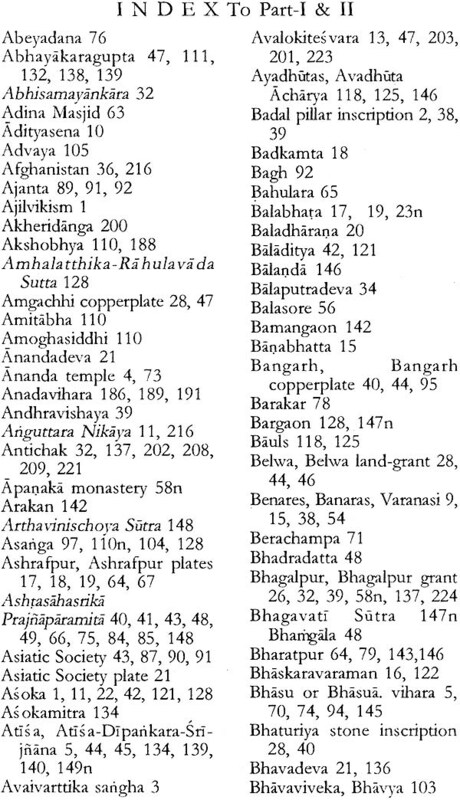 A few coins of Sasanka and Sama chara-deva are, however, contextually important, since they indicate the predominance of Brahmanical religion in the pre-Pala Bengal. Compared to coins, seals have been proved to be of adequate help. It is on the basis of the seals discovered at Rajbadidanga near the Chiruti Railway Station in the Murshidabad district that the location of Karnsuvarna, which was a flourishing centre of Buddhism in the sixth- seventh century A.D., has been settled with certainty. 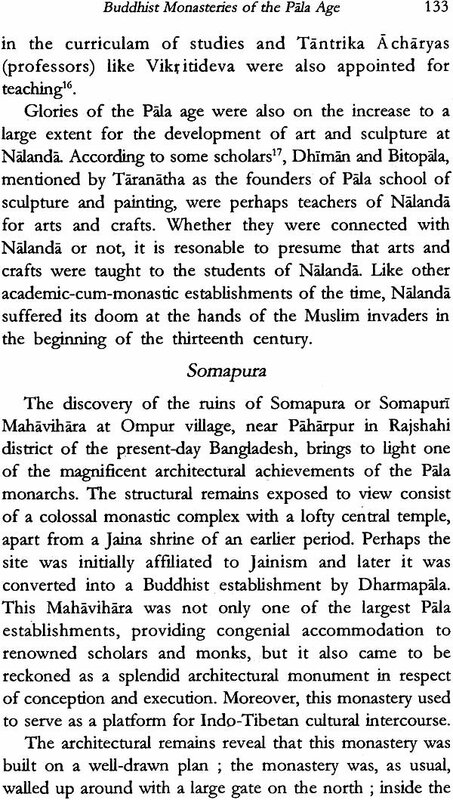 Similarly, the sites of the Buddhist Universities of Nalanda and Somapura have been ascertained by the seals, among other antiquities, recovered from the ruins at relevant places. The monumental evidence in the present context can hardly be overemphasized. The ruins of the aforementioned Buddhist monasteries of Nalanda and Somapura bear, inter alia, a glowing testimony to the flourishing state of Buddhist religion and learning. Numerous stone and metal images of divinities of the Mahayana-Vajra-yana pantheon of our period, found in Bengal and Bihar (ancient Gauda-Magadha kingdom) eloquently speak of the popularity of Buddhism among the royal members and plebeian masses. These images are understandably valuable for the study of the growth and development of Buddhism in general and Buddhist iconography in particular. Apart from the sculptures, painted illustrations of Buddhist deities borne by several manuscripts, belonging to the collections here and abroad, have not only helped the students of Buddhist iconography, but have also supplied significant evidence on the pictorial art that was practised in Bengal in the early mediaeval period. 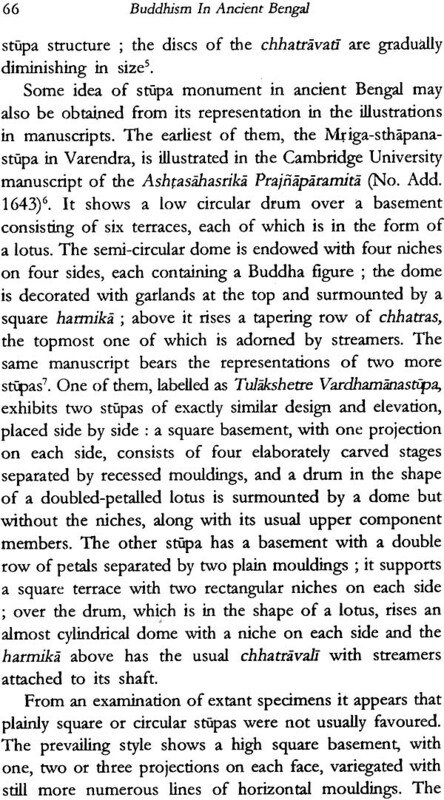 Some of the illustrated manuscripts bear representations (along with descriptive labels) of Tara of Chandradvipa. 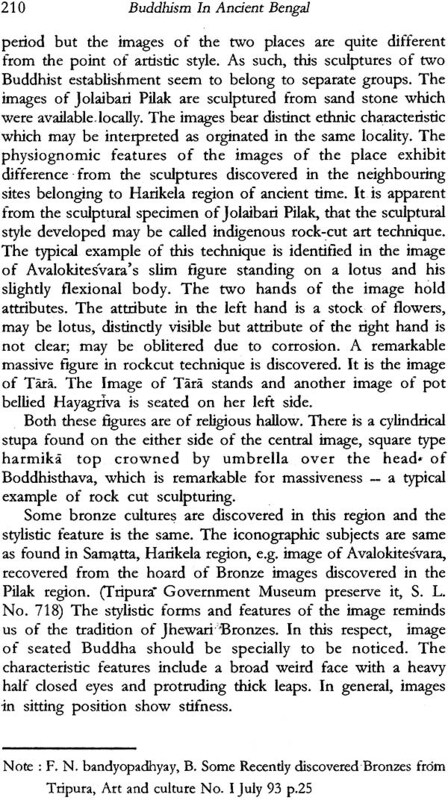 Chunda of Pattikera and Lokanatha of Harikela and it thus appears that stone or metal images of these deities enshrined in respective areas earned fame all- over Bengal, not only among the Buddhists, but perhaps also among members of other religious creeds. Similarly, the influence of Buddhist monument at Paharpur on South-East Asian architecture (e.g., Chandi Loro-Jongrang and Chandi Sewu in Java, and Ananda temple at Pagan) has been brought out by a comparative study of the relevant examples. 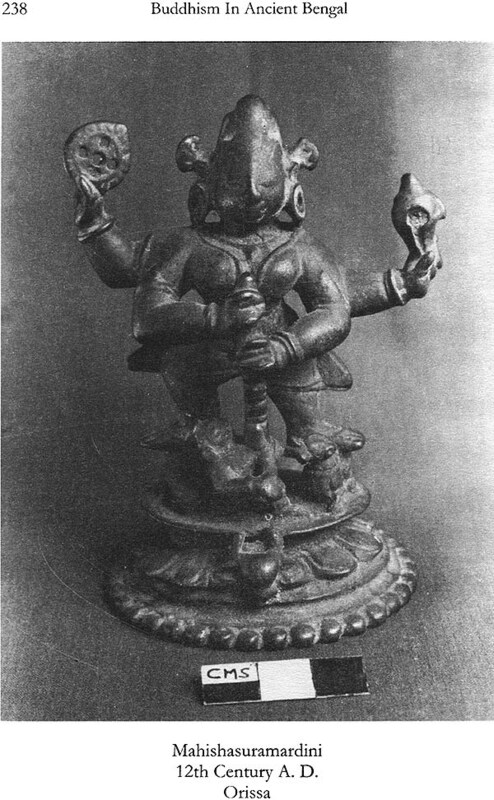 Likewise, the affinity between Bengal (i.e., Gauda-Magadha) and several South-East Asian sculptures is not far to seek. Literary source, usually corroborative in nature, has occasionally appeared as of independent and immense value in the context of the history of Buddhism in Bengal. In several cases indigenous (Sanskrit) and foreign (Chinese, Nepalese and Tibetan) texts have supplied us valuable information, which are otherwise unknown. Thus the offshoots of Mahayana Buddhism like Sahajayana and Kalachakrayana would have remained to us names only but for the discovery of a large number of manuscripts, mostly hailing from Nepal. The stages of the transformation of Mahayana into the mystic forms, generally designated as Vajrayana and Tantra-yana (more specifically Sahajayana and Kalachakrayana) and the account of the preceptors of these sects (who flourished some time between the tenth and twelfth centuries) have indeed come to our knowledge mostly from the manuscript materials. 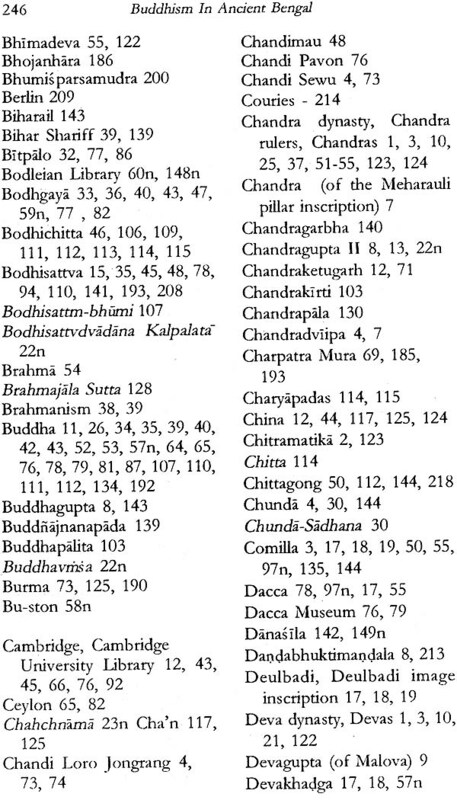 Literary texts, notably the Tibetan, have not only given us details about the celebrated Buddhist Universities of the stature of Nalanda, Vikramasila and Somapura, but have also informed us about the existence of many other Buddhist centres of learning like Traikutaka, Devikora, Phulla-hari, Partikeraka and Jagaddala. Chinese travelogues of Fa-hien, Hiuen-Tsang and I-tsing have left for us pen-pictures of the condition of Buddhism in the pre-Pala period. For instance, all these accounts bespeak the pre-eminence of Tamralipta as a noted centre of Buddhist studies from the time of Fa-hien till the close of the seventh century A.D. as well as the flourishing condition of Buddhism during the said period. Details about the introduction of Buddhism in Tibet from Bengal in the seventh century and its influence on the evolution of the culture of Tibet are also known from literary texts, chiefly from the Tibetan. Thus the Tibetan literature credits the Bengali savant Dipankara Srijnana (also known as Atisa) with the religious movement in Tibet and whatever is known of this great intellect is derived mainly from the Tibetan tradition. 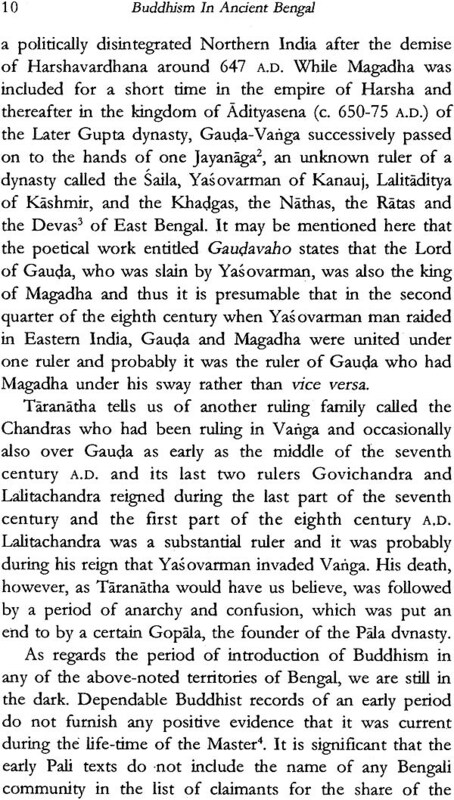 In short, Buddhism held a predominant position in the Gauda-Magadha kingdom during the period of the Pala monarchs and it enjoyed the same position in the neighbouring countries of South-East Asia. The salient fact of the history of our period has been brought out by the close and integrated study of the archaeological and literary sources as noted above. 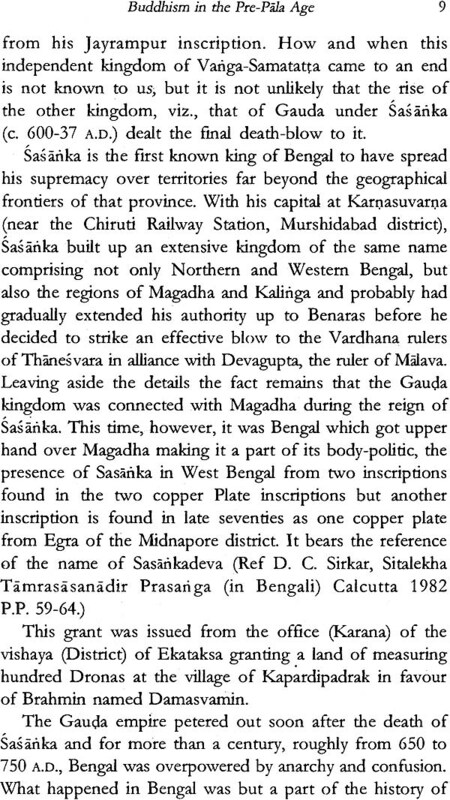 Mention may be made about the recent discovery of a prepala monastary complex and a copper plate from the excavated site in Jagjivanpur in the district of Maldah, the Archaelogical Directorate govt. of West Bengal had taken up the task of excavation of Tulabhita mound at first and carried in different stages upto 1996 and revealed the structure of a Buddhist monastic complex. Mention may be made about the discovery of a copper plate from Jagjivanpur on the 13th March 1987 which help us to solve the middle contd. A Moreover, it may be mentioned about the recent discovery of pala monastary complex and copper plate from the excavated site in Jagtivanpur in the district of Maldah in West Bengal. The Government of West Bengal Archaeological Department took up the task of excavation of this site and excavation carried on in Tulabhita mound at first later extended to otherareas in different stages up to 1996. The excavation reveals the strneture of a Buddhist monastary complex. Mention may be made about the discovery of' "a copper plate from Jagjivanpur on 13th March in 1987. This discovery helps us to solve the riddle of exact identity of Mahendra pala and established him as 'son of Devapala and successor of Pala throne. In the course of our investigation all possible sources in the shape of epigraphical records, archaeological monuments, icons and paintings, and literary texts and traditions belonging to our period have been explored and items of information gathered from them have been logically pieced together for the portrayal of Buddhism which flourished during the reigns of the Palas and their contemporaries. As the following pages will indicate, knowledge gaps in the history of this religion are still there, yet no pains have been spared to bridge them with the help all available materials. In other words, an attempt has been made for the first time in our dissertation to present a comprehensive history of Buddhism in ancient Bengal, though we do not claim to have uttered the final word on this interesting and significant subject.